Weligama is the nearest main town to Sunshinestories and a great place to explore on your free day from the villa. Occasionally we enjoy wandering around the shops, playing in the surf and hanging out at the cafés. The name Weligama means ‘Sandy Village’ due to its sandy beach which sweeps across the bay as far as the eye can see. A beautiful beach speckled with palm trees, and fishing boats dotted along the shoreline. 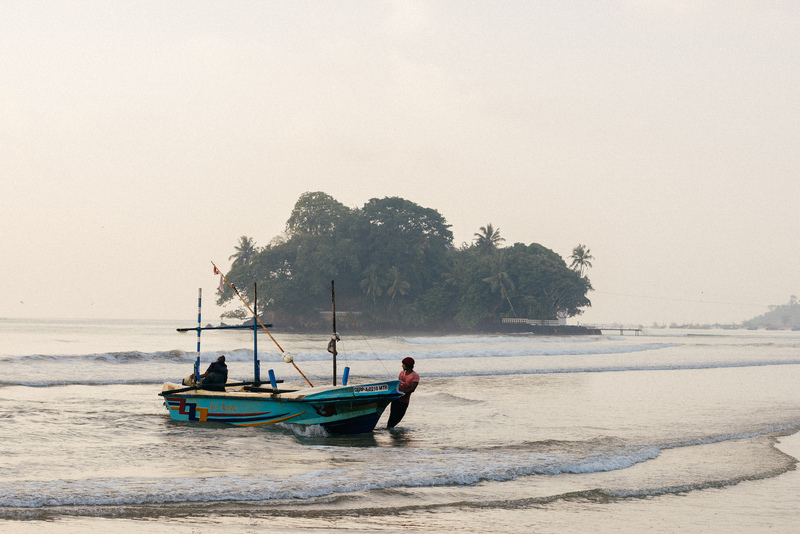 At one end of Weligama sits the iconic Taprobane Island with a colonial house nestled within its palm trees, only accessible by wading through the sea. During bigger swells waves break from either side, forming perfect peelers in both directions. This is an incredibly picturesque spot for logging sessions, particularly in the evening when the sun sets right in front of you. As you get further down the beach you arrive at Fish Point which also works better with a bigger swell, but its fun to dodge the fisherman’s poles sticking out of the sea on smaller waves. A little further up the beach sits a large rounded rock standing out of the ocean which forms a clean wave on either side with the right wind direction, it is a great spot for beginners or those on a longboard. In the heart of the bay is a string of surf schools which cater mostly for leaners. The main beach of Weligama is perfect for beginner to intermediate surfers and can handle waves up to 3-4ft. Those looking for a more challenging break which is less crowded should head to Fisherman’s Reef which is hidden at the back right of Weligama bay. This is an ideal surf spot for long boarders and short boarders during a bigger swell. There are a few lovely cafés in Weligama which are ideal for post-surf brunches and coffees. Our newly opened sister hotel Ceylon Sliders is situated opposite Taprobane Island with our café in a leafy courtyard at the back. Ceylon Sliders opens at 7.30am to 2pm each day serving a selection of healthy goodness, such as granola bowls and sweetcorn fritters, great Sri Lankan coffee, fresh juices, cakes and more. At the opposite end of Weligama you’ll find SOUL café, an intimate space on the second floor which serves smoothies, juices and a variety of sandwiches, wraps and salads. Hangtime Hostel sits in the heart of Weligama bay and is another favourite of ours, there is a relaxed vibe and amazing views of the whole bay from the top. Here you’ll find more western dishes such as burgers, pasta and pizza. Weligama has many different western, local and alternative restaurants to choose from. In front of Fish Point surf break is the laid back beach front Fish Point restaurant. Choose the catch of the day from the stand and watch them rustle it up fresh for you. It always has a relaxed ambience with candle lighting. Another good spot for dinner in Weligama is Break Point Restaurant close to the main junction. The menu consists of wood fired pizzas, falafel and curries, ideal options after a long day in the surf. W15 is a slightly more sophisticated option for dinner with a large western menu. Positioned at the far end of Weligama bay directly on the beach, it offers the perfect place for sunset cocktails whilst watching the surfers out front. Most mornings there’s a lovely local market situated along the back streets of Weligama. Here you’ll find an abundance of fresh produce, such as fruit and vegetables, grains and honey, as well as plants, clothing and fabric. At the back of Weligama sits rows of shops selling plastic goods, books, beauty products, alcohol and more. It’s quite an experience walking through the busy streets and discovering random shops. If you feel like completely relaxing, head to W15 for a dip in the swimming pool overlooking the surf. There’s plenty of comfy cushions and chairs to lounge on during a lazy afternoon with a coconut in hand. Weligama also has a couple of temples which are worth a visit, each are beautifully decorated and welcome foreigners inside.